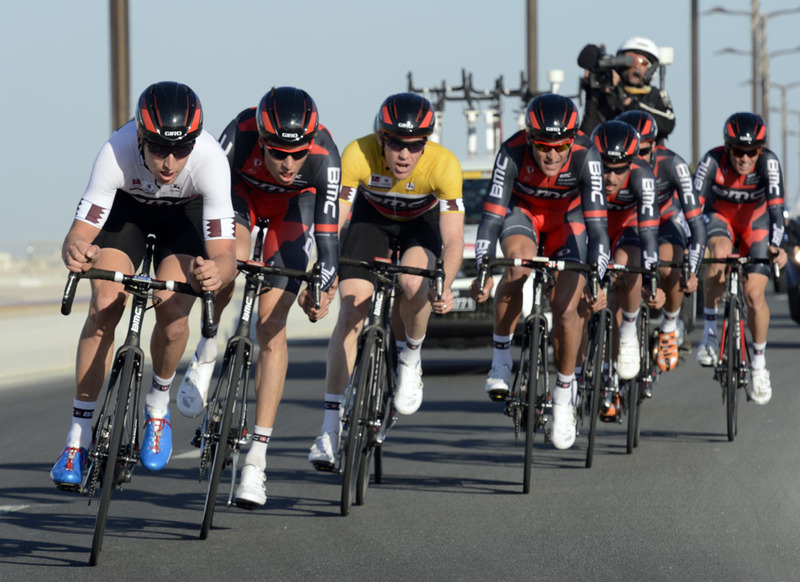 Some specific training in the south of Spain paid off for BMC as they raced to victory in the 14km stage two team time trial in the Tour of Qatar five seconds ahead of Team Sky and ten seconds quicker than Omega Pharma-Quick-Step. Taylor Phinney was the powerhouse in the American squad but it was his teammate and countryman, stage one winner Brent Bookwalter, who retained the leader’s golden jersey. Behind him, the general classification is stacked with BMC riders, with Phinney second and Britain’s Adam Blythe third. Bernhard Eisel of Sky is 6th at 11 seconds. The out-and-back course on wide roads was not technical, but the strong wind – headwind on the way out, tailwind back – made it challenging and different teams adopted different approaches. 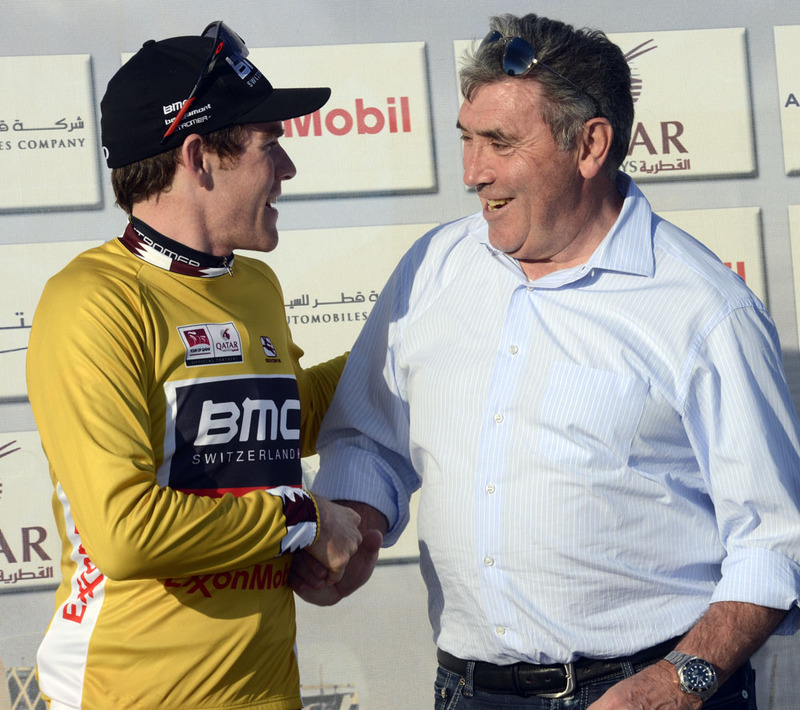 It was telling that BMC retained all eight riders until the final 1.5km. “Everyone in the group was fantastic,” said Steve Cummings, the other British rider on the team. “It’s the best team time trial I’ve ridden; we were really smooth as a unit. “We did a lot of work for this at our training camp in the south of Spain with Max Sciandri and Allan Peiper, who’s really helped the team step forward,” added Cummings. Phinney will be most people’s favourite for the overall, though the wind is forecast to drop in the coming days, which should favour the pure sprinters. Phinney said he arrived in Qatar on the back of his best ever winter’s preparation: “I ended last season at a pretty high level and stayed on top of things throughout the winter. “I had a great, problem-free winter, which is something that I’ve never had over the past couple of years. Phinney also felt the team time trial drills in training were significant. “It was a couple of days when we exclusively worked on the team time trial with this group,” he said. “It just so happened that where we were in Spain it was even windier than it was today. As for the overall, Phinney said: “You never know. Qatar is a strange race, you never really know what can happen here. We are going to try to keep this jersey on Brent’s shoulders for as long as possible and Adam and I will be up there in the sprints.